I’ve wanted to read this book for ever so long and finally I get the chance! I loved War and Peace and very much enjoyed Anna Karenina – I’ve read a few other shorter works as well but never The Cossacks. Tolstoy wrote this very short novel, a novella really, right before he wrote War and Peace and you can see his ideas developing. The book may be based on a bit of Tolstoy’s life when he went to the Caucasus with the army. He was quite in debt when he left and it is at that time he started writing and the army experience turned him into a pacifist and anarchist (voluntarist). The story is about Dmitriy Olenin, a rather dissolute young man without immediate family ties who lives in Moscow. He gets tired of his life and joins the army to go to the Caucasus (southern Russia near the mountains) where he is very much taken by the Cossack way of life. He loves the landscape and the people and although it takes a bit for him to find his place there, he eventually does. He hunts and fishes and drinks with the Cossack men, he talks to an old grandfather-type he meets. He is generous but a bit shy. He gives a horse to one of the young Cossack men, Lukashka, who is tentatively engaged to the village beauty, Maryanka. Lukashka then kills an enemy scout and is heroized – said to be a “brave” and a date is set for the wedding. But meanwhile Olenin has fallen in love with Maryanka and she is interested in him. But she rebuffs him time and again – or she teases him – it’s hard telling about her. But she is probably only putting off her decision because she is very level-headed and strong. Beletsky, Olenin’s friend from Moscow, convinces him to be more assertive but that backfires. Then Luka is wounded in a battle and Olenin quickly advances on Maryanka only to be more firmly rebuffed. Olenin realizes he can’t ever really be a Cossack and leaves. The point is, I think, that civilized society corrupts man and he can never really go back to being a natural person as the Cossacks in the village are. When he goes back to the place a stag was killed he feels happy and starts wondering why. (p. 52) He realizes he is happy in this natural setting where he wasn’t happy at all in Moscow. 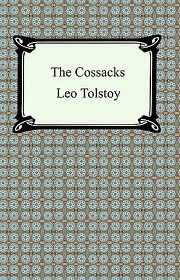 Then in the second half of the book he tries to become as much of a Cossack as he can and win the heart of Maryanka. It doesn’t work. He realizes that society has corrupted him too much for that. It’s really a sad book in the end.